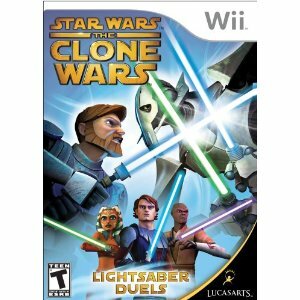 I bought Star Wars the Clone Wars: Lightsaber Duels/Jedi Alliance for Nintendo wii. If there’s ever a video game that I’m sucker for, it’s one that has open battles with lightsabers. Game on. Sign me up. I’m not a picky gamer. Heck, I’m not really even a gamer. (Though I’ll school anyone on Super Mario Bros. 2.) So “Lightsaber Duels” easily entertains me. This review is based on 22 minutes of game play, so I can’t offer too much insight. I started with a quick “free play”. Player options included Anakin Skywalker, Obi Wan Kenobi, and that chick with the elephant trunks growing out of her head. Obi Wan was my pick and I had to battle the bald scary evil jedi lady (couldn’t select any other villian). She was no match for my aimlessly random arm motions. I decided to take some training and things were pretty straightforward. Then I did the full-on battle and had to fight the bald chick with each of the three forementioned jedi. Then I had to fight Count Dooku and well, my arm was pretty tired by that point. Count Dooku will have to wait to fight me! (autosave lets me pick up the battle later). It’s a pretty entertaining game. Honestly most of the time I was just waving around the wii remote like a drunk gorilla stealing a wii remote from a bigger gorilla. And that tactic served me quite well. I have three complaints about this game. 1. I suppose I have unlock something to get to use Mace Windu. Hmph. 2. It appears that Darth Maul is nowhere on this game. I suppose Maul pre-dated the Clone Wars. Details. Details. 3. No internet-play-against-other-humans function on this game. Lame. I will have to just resort to slicing up the computer or any random house guest with my drunk gorilla lightsaber tactics. If you want to rest your light saber arm, you should try Star Wars Battle for Hoth on iphone and ipod touch. It’s pretty cool. http://bit.ly/bVirGa It’s not a button masher game, instead it’s much more strategic. You place your soldiers, trenches, fighter planes at specific spots according to the terrain. And they duke it out for you. You just watch, and adjust the placement of your troops at the Empire increases their attack.